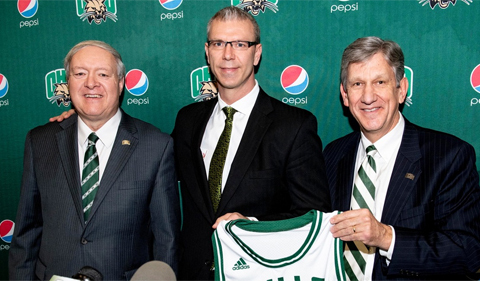 From left, OHIO President M. Duane Nellis, Coach Jeff Boals, and Director of Athletics Jim Schaus. Former OHIO team captain Jeff Boals ’95 was named the 19th head coach in the history of the Ohio University men’s basketball program, Director of Athletics Jim Schaus announced in a March 17 news release. “I am incredibly grateful and honored to return home to my alma mater as the head men’s basketball at Ohio University,” said Boals, who earned his B.S. in Biological Sciences from the College of Arts & Sciences at OHIO. A native of Magnolia, Ohio, Boals served as a two-time team captain and garnered four varsity letters under the leadership of his head coach, the late Larry Hunter. Connect with Boals on LinkedIn. “My family and I are thrilled to see my coaching career come full circle with this opportunity. Sincere thanks to Dr. Nellis and to Jim Schaus for their confidence in me to lead the young men of Ohio both on and off the court,” Boals said. Boals is returning to Athens after spending the previous three seasons (2016-19) as the head coach at Stony Brook, where he guided the Seawolves to an overall record of 55-41 – including a 31-17 mark in America East Conference play. Stony Brook is making its second postseason appearance in the last three years. A member of Thad Matta’s coaching staff from 2009-16, Boals helped guide Ohio State to seven postseason appearances, including six NCAA Tournaments. The Buckeyes, who won or claimed a share of three Big Ten Conference titles, advanced to the Final Four in 2012. Ohio State went 193-62 during Boals’ time in Columbus. Boals was instrumental in bringing some of the top players in the nation to Ohio State, including current NBA stars Jared Sullinger and D’Angelo Russell, along with Aaron Craft, the all-time steals and assist leader in Ohio State history. He also coached the 2010 National Player of the Year, Evan Turner, during his outstanding collegiate career with the Buckeyes. Boals and his wife, Katie, have two children, Sydney and Chase. Vedder in Forbes | Does Attending Elite Colleges Make You Happy? Copyright © 2019 Ohio University | College of Arts & Sciences. All Rights Reserved.